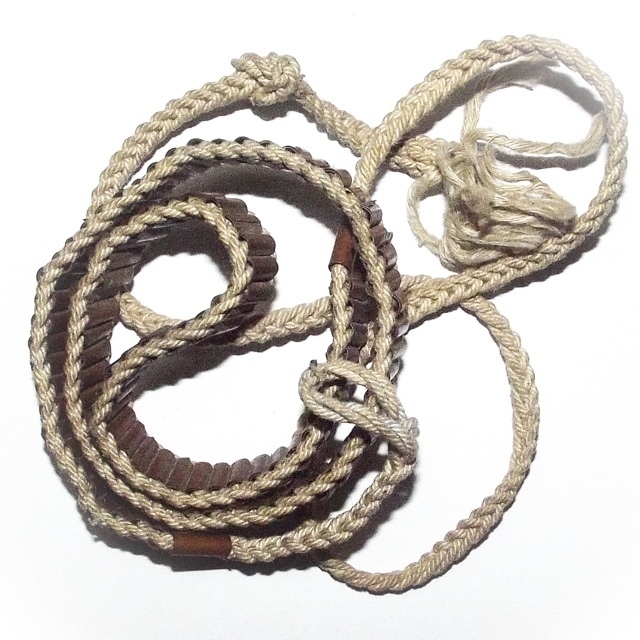 Sacred 108 Takrut Spells (Nuea Tong Daeng) on cord belt from the Great Luang Por Jong Puttassaro of Wat Na Tang Nork. An immensely rare exhibit with one hundred and eight hand inscribed and empowered Yantra Scroll Spells, made in the days of old by the Great Master. The Takrut Kart Aew provides 108 different Magical Spells covering an immense range of protective and Karma Improving Powers, for Metta Maha Niyom, Kong Grapan Chadtri, Klaew Klaad, Serm Yos, Serm Duang, Maha Sanaeh, Maha Pokasap, Gae Aathan, and all other imaginable Magical Blessings for a complete compendium of Auspicious Lucky Fortunes and Safety. The Takrut are made from Nuea Chanuan Tong Daeng, Sacred Copper Yantra Foils, and are bound together into 108 Spells, mirroring the 108 Pra Tamma Khant Dharma Sermons, which make up the Sacred Numerology of the number 108. This is the same Numerology used in the making of Buddhist Rosaries, which also contain 108 Beads, for the very same reason. There is a particular faction of collectors who specialise purely in the collection of Takrut of lp Jong, and this is a category in itself that is accepted for Competition in many Amulet Shows and Competitions. It is not known exactly which date Luang Por Jong was born, for there is no official documentation of his birth. But it is stated in his family lineage, that he was born during the time that King Rama 5 was ruling Siam, on a Thursday of the year of the monkey on the 8th Lunar Phase, which, when calculated from knowing the Year of Monkey during the Reign of King Rama 5, within Luang Por Jongs childhood, would mean he would have been born on the 6th of March 2415 BE. His trajectory followed on from that, and he never stopped advancing, becoming one of the Greatest Sorceror Monks of his Era, until his passing in the year 2508 BE.